Sixteen-year-old heiress and paparazzi darling Liddi Jantzen hates the spotlight. But as the only daughter in the most powerful tech family in the galaxy, it's hard to escape it. So when a group of men show up at her house uninvited, she assumes it's just the usual media-grubs. That is, until shots are fired. Liddi escapes, only to be pulled into an interplanetary conspiracy more complex than she ever could have imagined. Her older brothers have been caught as well, trapped in the conduits between the planets. And when their captor implants a device in Liddi's vocal cords to monitor her speech, their lives are in her hands: One word and her brothers are dead. 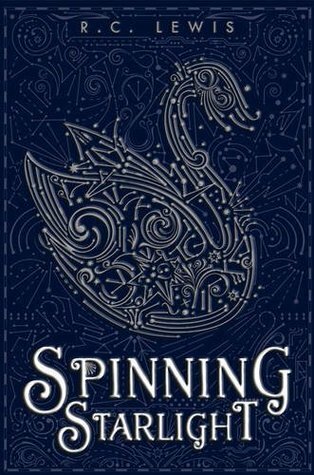 One of my favorite fairy tales is Hans Christian Andersen's The Wild Swans, so I was beyond excited when I read the above synopsis for Spinning Starlight. And I must say, I was not disappointed with Lewis' retelling of my favorite. I really like Liddi's character. She was both a really strong character, and so very insecure about her own self worth, making her feel true to life and three dimensional. Liddi felt like someone I could relate to. Someone I could see myself being friends with, if she lived in the same world I do. Lewis does a fantastic job of portraying her struggle of coming into her own, while trying to come to terms with what the public world was constantly demanding of her. And even though she spends the majority of the novel forced into silence, lest she kill her brothers, Liddi still manages to be a very complex character. Watching Liddi try to navigate a foreign world without the ability to speak was both humorous and frustrating because Lewis wrote it in such a way as to make you want to reach out and help her. I did find Tiav a bit flat in comparison to Liddi, but loved him just as much. He was such a human character, that the gut wrenching misunderstanding in the latter half of the novel was completely believable in its drama. Further, I adored the strong familial ties Lewis crafted between Liddi and her eight brothers, and Tiav and his mother. It gave this retelling a true sense of the backbone of the fairy tale, which to me is the relationship between the siblings. I loved the strength of Liddi's brothers, and the sense of self they gave to her, even when they weren't present. My only complaint is about the amount of science speak that's interspersed throughout the novel. I found it to be a bit distracting as a whole; however, I'm not much a science type gal, so that may be a personal preference coming into play. Spinning Starlight was a wonderful retelling of a classic, lesser known fairy tale, and I look forward to not only adding it to my library, but also gobbling up Stitching Snow.